The violence in Syria has created one of the worst humanitarian crises of our time. From a pre-war population of over 11 million people, almost half have either been killed or forced to flee and seek refuge in neighboring countries. In March 2017, the Syrian Observatory for Human Rights reported that a total of 465,000 people had died in the crossfire. Just this past week, over 500 people were killed from airstrikes and shelling, including 190 women and children. According to the U.N. approximately 6.3 million people have been internally displaced, with 5 million refugees in neighboring countries. 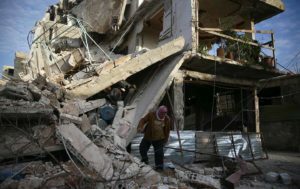 Syrian government forces have carried out scores of indiscriminate, but deliberate attacks on civilians and their practice of incommunicado detention and torture have remained unrestrained. Throughout Syria’s near seven-year civil war, human rights violations have been severe and numerous. U.N. reports state that the war has been “characterized by a complete lack of adherence to the norms of international law,” by warring parties who are responsible causing “civilians immeasurable suffering.” According to them and various other organizations, human rights violations have been committed by both the government as well as the rebels, although a majority of the abuses are the government’s doing. The civil war crisis began with anti-government demonstrations in March 2011, as a part of the Arab Spring. However, after a violent crackdown from the government, the peaceful protests quickly escalated and armed opposition groups began fighting back. The U.N. commission investigating human rights abuses in Syria confirms at least nine intentional mass killings in the period between 2012 and 2013, eight of those were committed by the Syrian government, and one was the opposition. Along with the aerial bombings, Assad has also been accused of using chlorine gas and other chemical weapons against civilians and conducting extrajudicial killings. As a defense, the Assad regime claimed that their actions were in an effort to rid Syria of the Islamic State, but the civilian body count outweighed what little success Assad found through his methods and the situation only worsened. By 2014, ISIS militants began seizing large areas of territory is Syria, namely Raqqa and Deir ez-Zor; the Islamic State’s de facto capital and the oil region, respectively. Throughout this continuation of violence, there have been ongoing international efforts to put into effect a ceasefire. Talks brokered by Russia, Turkey, Iran, and parallel talks sponsored by the U.N. have done little to decrease the severity of the situation. However, on February 24th, the United Nations Security Council unanimously approved a resolution demanding a 30-day ceasefire in Syria in order to deliver humanitarian aid to millions as well as evacuate the critically wounded and ill. The resolution mandated that the ceasefire should take place within 72 hours, a last minute mandate by Sweden and Kuwait in order gain Russia’s support. Russia’s U.N. Ambassador Vassily Nebenzia repeatedly stated that an immediate ceasefire was unrealistic and the vote was delayed twice on Friday. In a tweet that same day, U.S. Ambassador Nikki Haley wrote that she found it “unbelievable that Russia is stalling a vote on a ceasefire,” and asked, “How many more people will die before the Security Council agrees to take up this vote?” The Security Council eventually scheduled the vote to take place on Saturday, leading the demand for a ceasefire.